With Shop-Script, you can create an online storefront directly inside Facebook. Your product catalog and checkout process will be displayed within Facebook. All storefront pages will match the style of other Facebook pages so that customers perceive your storefront as a part of the social network. Setting up a Facebook storefront in Shop-Script. 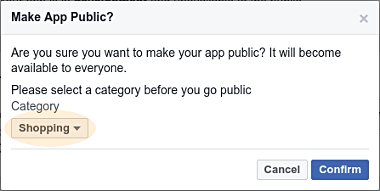 Creating an app in your Facebook account. Install an SSL certificate for your domain name. It’s a requirement of Facebook. If you are a user of Webasyst Cloud, then you already have an SSL certificate free of charge for domain name ***.webasyst.cloud. You can use that default domain name to create a fully functional online storefront in Facebook without registering a personal domain name at .COM, .ORG, or .NET. Create an account in Webasyst Cloud or install and set up Shop-Script according to the instructions. Install design theme Facebook via Installer app in your Webasyst account. That theme was specially created to make the storefront appear as part of the Facebook interface. Enable the "Hidden settlement" option, select other parameters for the Facebook storefront, and save the changes. Open the URL of the created Facebook storefront to ensure that the above instructions have been completed correctly and this extra storefront is indeed styled in accordance with the social network design. 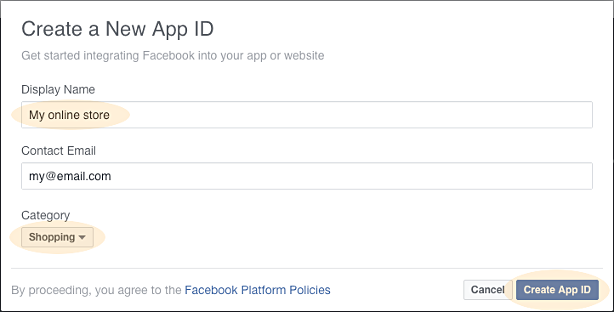 Extend your Facebook account status to the developer level if you do not have that status yet. In order to create a Facebook page, open "Create page" section. Select the desired page type (e.g., “Company, Organization or Institution”) and follow the on-screen tips. Upon creation of a Facebook page, add a tab to the page so that Facebook users can click on it, open your online storefront inside Facebook, and proceed to shopping. 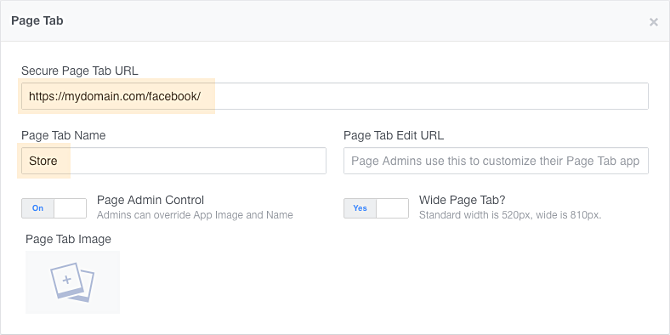 To add a tab, first create a Facebook app with your extra storefront as described below. Open Facebook app management page. Click “Add a New App”. Enter an arbitrary name for your app; e.g., your store name, and select a category; e.g., “Shopping”, and click “Create App ID”. Open section “Settings → Basic”. 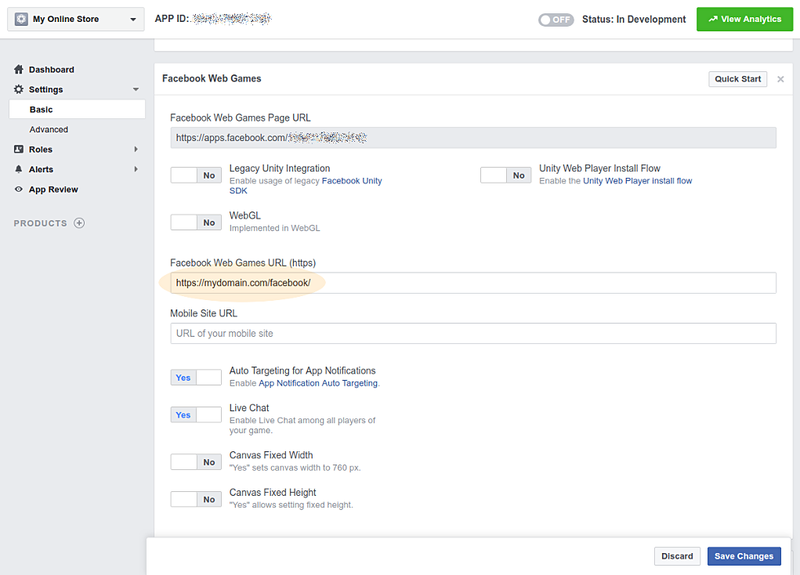 New block “Facebook Web Games” will be added to the app settings page. 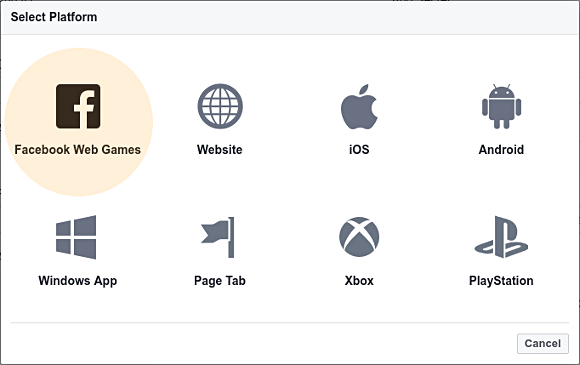 In field “Facebook Web Games URL (https)” paste the URL of your store’s Facebook storefront, with https:// protocol. Copy “App ID” value at the top of the page. You will need it for further setup. On Facebook app editing page, open “Settings → Basic” and click “Add platform”. 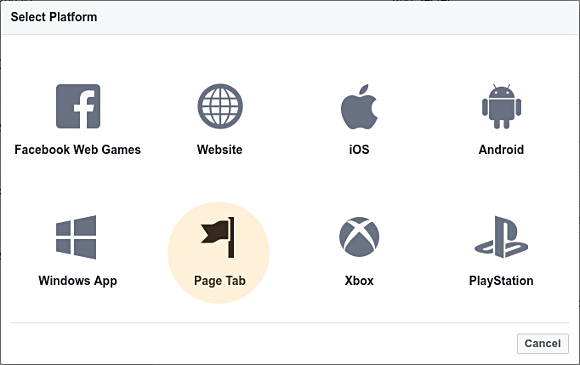 — Secure Page Tab URL: Copy here the secure URL of the extra Facebook storefront set up in your Shop-Script backend. — Page Tab Name: Text caption you want to be displayed on the tab. Facebook users will click on this tab to open your Facebook-styled storefront inside the main Facebook page and proceed to shopping. On the page that opens at that URL, select the page name from the Choose Facebook Pages list and click on Add Page Tab. Your Facebook-styled storefront appearing in the browser window right after that will mean that the application tab has been successfully added to the main Facebook page. Open the list of your Facebook apps at https://developers.facebook.com/apps/. Click on your new Facebook app name to view its details. Copy the App ID and paste it to the corresponding design theme settings field in Shop-Script backend at "Shop → Storefront → Design → Appearance". On Facebook app editing page, open “App Review” section. Switch the toggle to “Yes”. Select a category; e.g., “Shopping”. Confirm your choice with a button. You have created your own online store in Facebook with Shop-Script. Its storefront is available via a tab on the store's main Facebook page, and you can already begin to accept orders from Facebook users. 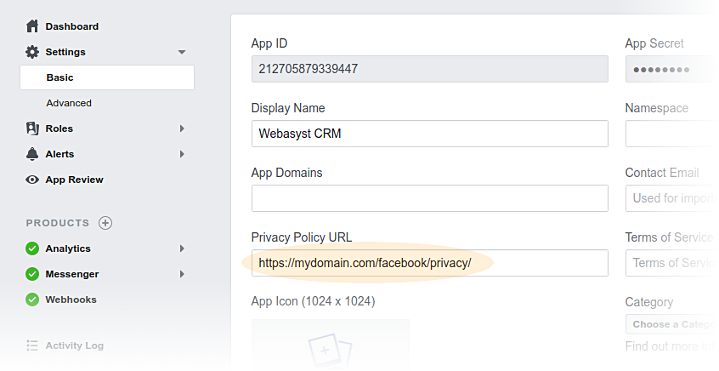 You can also connect other Webasyst apps to your Facebook storefront as described in the next section. Design themes adapted to the appearance of Facebook pages are also available for other Webasyst apps: Site, Blog, Photos. This allows you to add extra tabs to your Facebook storefront such as “About us”, “Our blog”, “Photo album”, etc., powered by other Webasyst apps just like the storefront is powered by Shop-Script. In order to add extra tabs to your Facebook storefront, you need to create corresponding hidden settlements in the “Routing” section of the Webasyst Site app for Site, Blog, or Photos and select the “Facebook” design theme for those settlements, exactly like you have created a hidden settlement for Shop-Script. url elements should contain the relative URL of the appropriate settlement created in the Site app (without the trailing * character). name elements should contain text captions to be displayed in the tabs you are creating. The App is intended for a User to place orders towards the Author and for the Author to process them. Placemen of an order by a User includes transfer of their personal data to the Author, which is mandatory for the normal operation of the App. These personal data are hereinafter referred to as “Basic personal data”. In addition to that, the App’s functionality enables a User to send other their personal data to the Author, which are hereinafter referred to as “Extra personal data”. The Policy governs the use of Basic personal data and does not govern the use of Extra personal data. Further in this Policy, User’s personal data are understood only as their Basic personal data unless explicitly stated otherwise. [list other contact fields that are requested from customers during checkout in you online store]. User’s personal data are used by the Author’s staff to identify a User in the App’s backend interface, to deliver ordered items to a User, and automatically generate personalized messages to be sent by Author to User. transfer of personal data after obtaining written consent from a User by email or via User’s online account on Author’s website www.domain.com. Any disagreements between a User and the Author related to the processing of a User's personal data by the Author during the use of the App are governed by the provisions of the Policy and the legislation of [COUNTRY NAME]. A User is allowed to access the App only if they have reached the age of 18 years. Underage Users may access the App only on the consent or under the supervision of their official guardians. The Author may make changes to the Policy at any time without prior notification of a User. In case of changes made to the provisions of the Policy, the Author must notify a User about all such changes by publishing information on the Author’s website www.domain.com or by sending an email notification to a User. Updated provisions of the Policy will come into force as of the moment of such publication or of sending such an email notification. The Author undertakes to provide qualified response to each of a User’s support requests, relating to the processing of their personal data while using the App, without unnecessary delay. A User must send such support requests to the Author via their online account on the Author’s website www.domain.com.